October has come round quickly, and our first (and only) market this month is on Sunday, 8th at the Marina. I am very excited that October sees the start of our School of Cake workshops, being held at Waunarlwydd Rugby Club. You can find full details of available workshops on the School of Cake page. 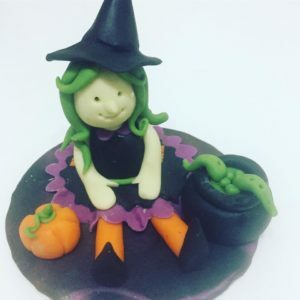 For our first modelling meet-up, the theme is Halloween, and we will be making this delightful little witch. Hi Jerome, yes we will be. 6″ cakes will be £27, 8″ cakes will be £46. We will be posting details in the next few weeks. Thanks.